Board Index > Beacon Talk > Beacon and Moogis > Wed. 3/6 set list? Author: Subject: Wed. 3/6 set list? With tonight's announced guests, I'm again curious if there is anyone there who can post a list? I'm itching to know what's going on. It's times like these that I really miss Moogis. All I've heard from a friend there is that John Popper showed up. People posting on Twitter say Popper joined for a few songs in the first set (no confirmation on what just yet), and that set two has started and the Blind Boys are out. One Twitter person mentions Amazing Grace/House of the Rising Sun, which is a typical Blind Boys "mash up"
GREAT SHOW! That's all I got time for! great, great show. Highlights for me were The Same Thing, The Weight and then everything after. In some far away universe, Jimi Hendrix and Duane Allman somehow mated. Sorry for the massive pic! The Same Thing was just unreal. The ?? 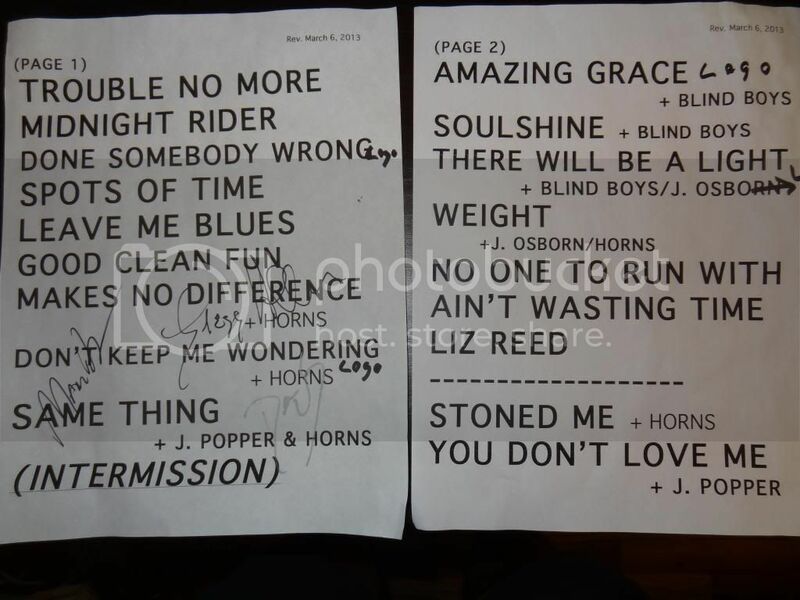 in the second set was "There Will Be a Light" from the Ben Harper/Blind Boys of Alabama collaboration album. The solo section at the end of The Same Thing was unreal, with Popper, Derek, Warren, and the Horns' trumpet passing it around faster and faster. The Weight was spectacular, 15 musicians on stage with great vocals and an extended ending. I have the actual setlist from the show (and got Derek, Gregg and Marc to sign it). How do I post the picture? Thanks Man. Looks like a great show. Juicy! Lovin it! Cant want till tear it up the 15th n 16th! Though a great show, I have to say what's with the men harassing the women? I understand there are way more men than women there but before the show started there were men yelling things at my girlfriend and another woman we were with to the point that they almost left. It's as if these guys don't get out at all.